Life is sweeter with you my Adie babes! 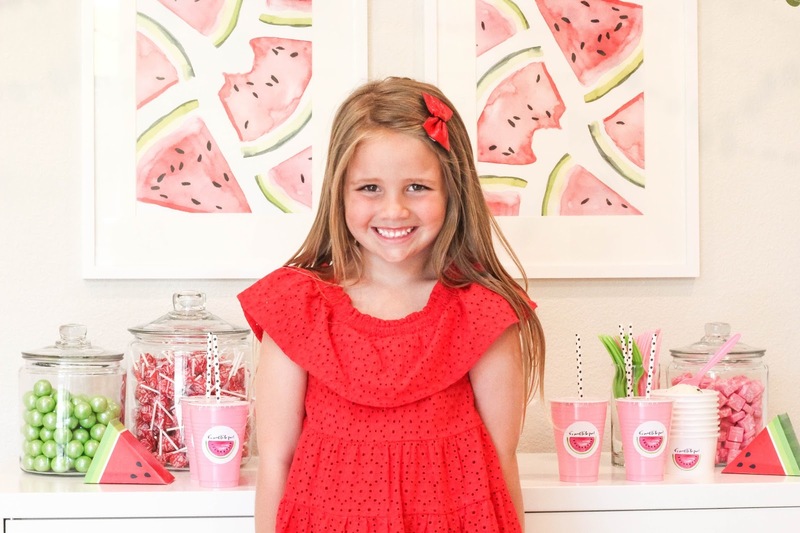 Celebrating our sweet girl has been so fun + watermelons for the win! Adie says I should say: her favorite thing was her hatchimal dinosaur from Nana and Papa ... it really is the cutest thing ever! 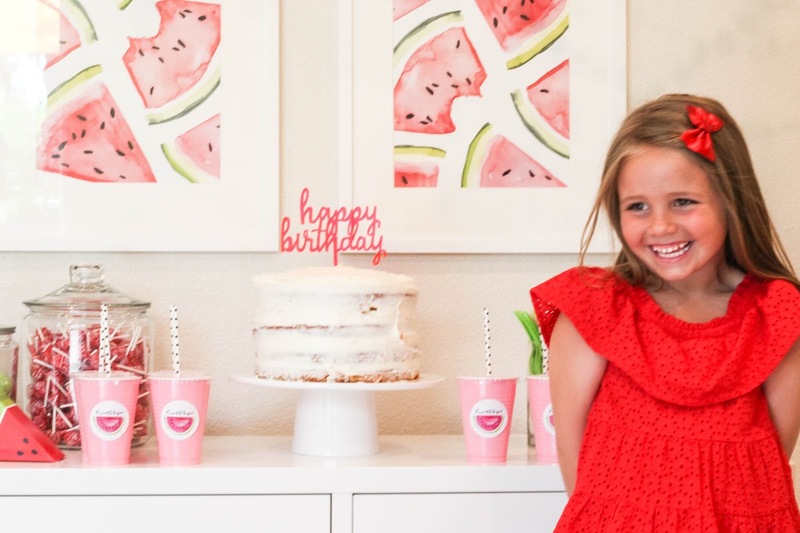 Adie picked a watermelon theme after she picked a flower party + a candy party but we were getting too close to her birthday so we stuck with watermelon. It was like summer in a party! 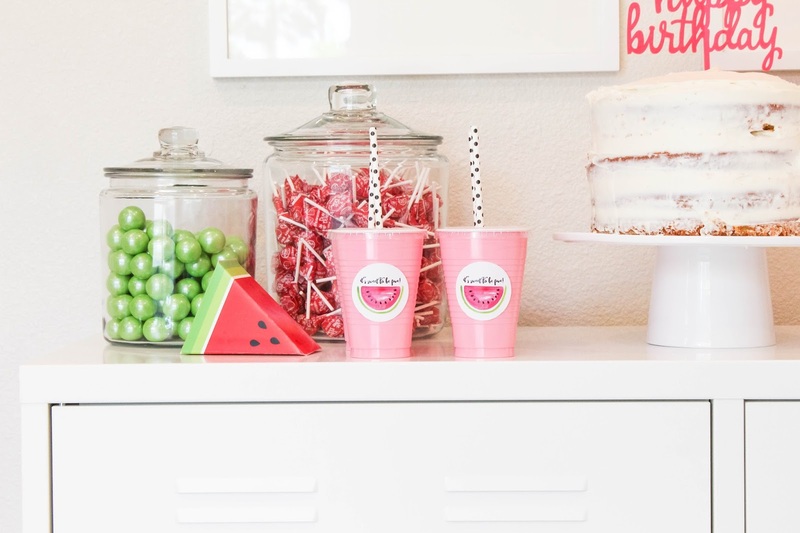 I have been trying to do simple but freaking awesome parties because Pinterest either makes you feel like a rockstar or it completely overwhelms you (at least for me). 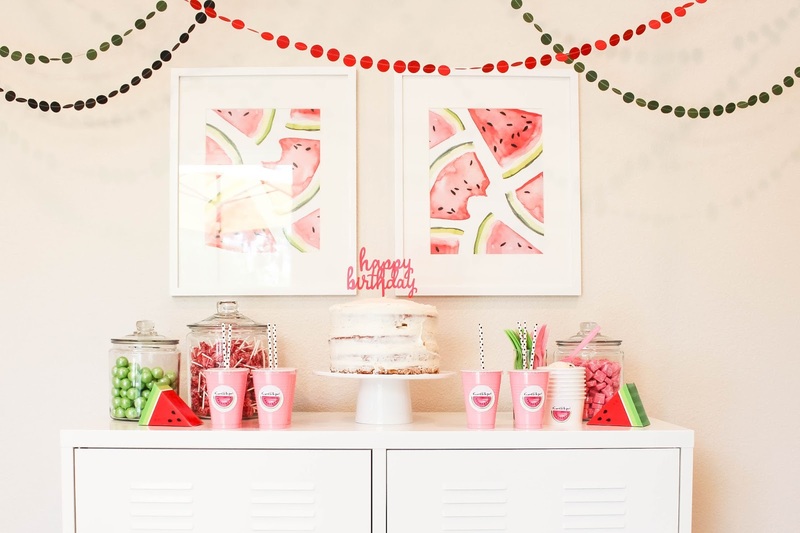 Her watermelon party was pretty much a DIY party and I love it. 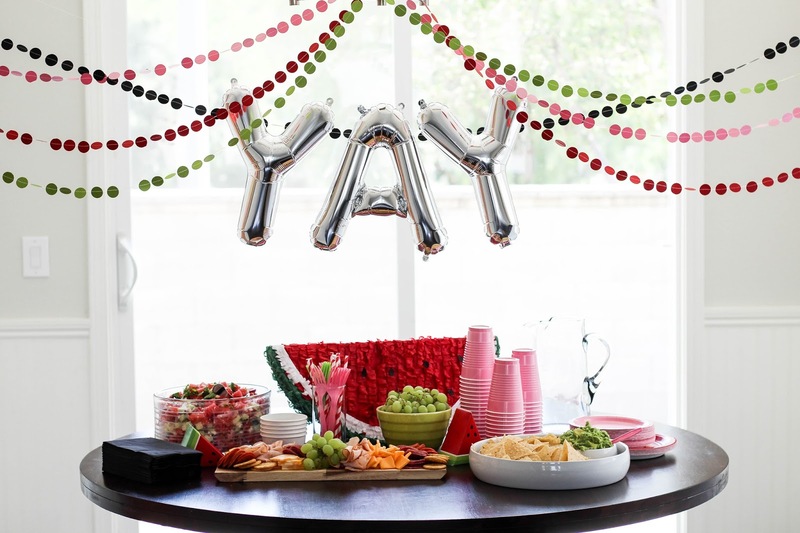 One of my favorite go-to party decorations is garland + it's so easy! It transforms any room into a party. I bought this watermelon print for $5 and printed them at FedEx for like a couple of bucks and put them in frames. 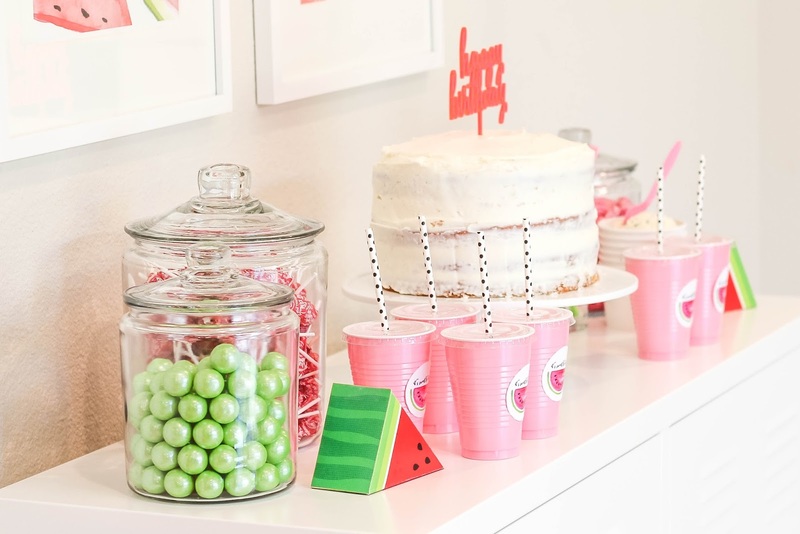 Also found these watermelon party boxes and put watermelon sour patch candy inside for each little party goer. 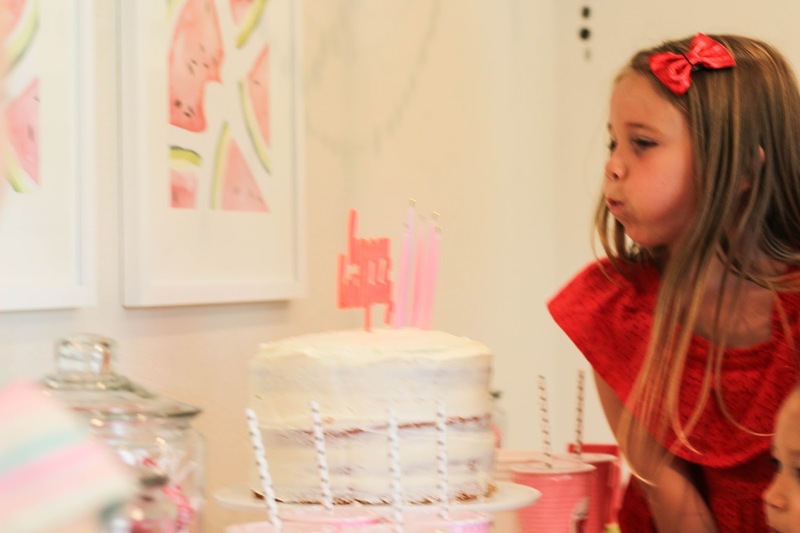 Adie's birthday invitation was simple and so sweet. 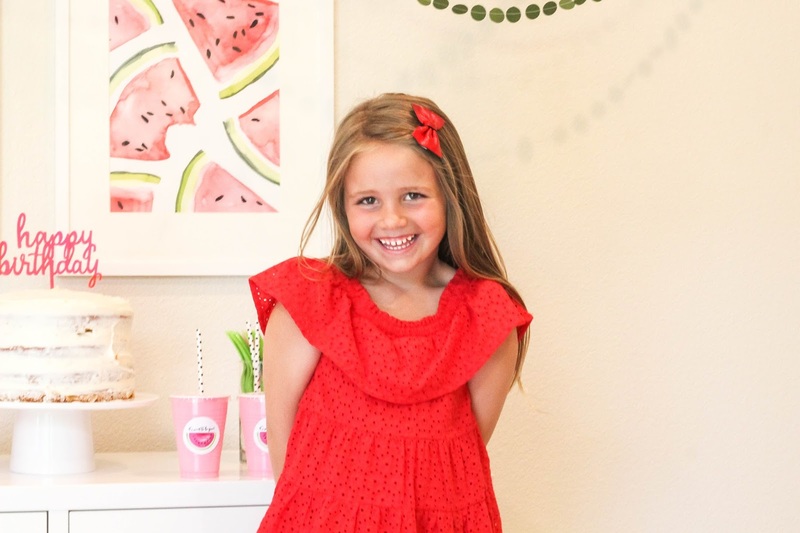 I came across the nicest Mama ever and she threw in our information + the cutest little watermelon with it's sweet to be five. 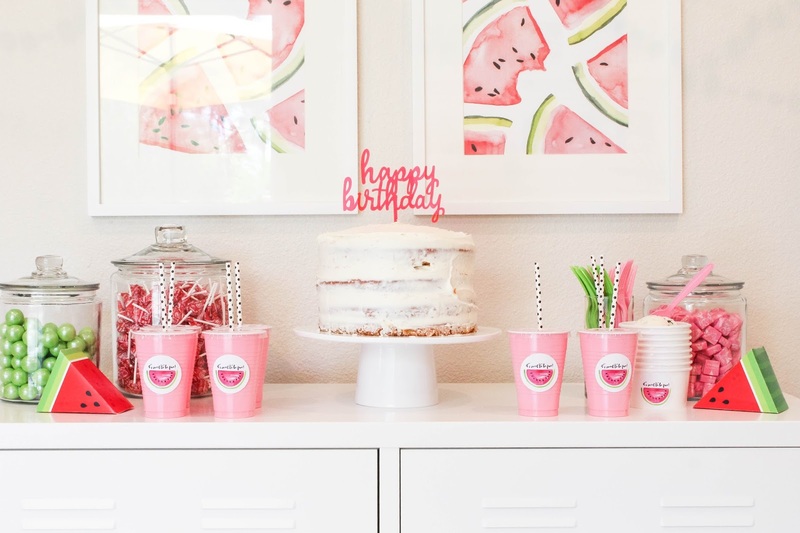 She told me that us DIY Mama's have to stick together and she literally rocked our party. :) I printed a ton of them on sticker paper, 2 inch hole punched them out and put them on a few cups and little snack bowls we used for ice cream. Jars from Target are so affordable and work for everything ... we broke two lids this weekend but they made it through the party. Green gum drops, red dum dum suckers and pink starburst Aden kept sneaking (that's how one lid broke) handfuls at a time. :) The way he says starburst with a mouthful of starburst is totally worth recording. I made her cake which turned out so great and so yum! Eating it for breakfast isn't that bad either + I bought way too much chocolate chip ice cream so we are eating that nonstop. 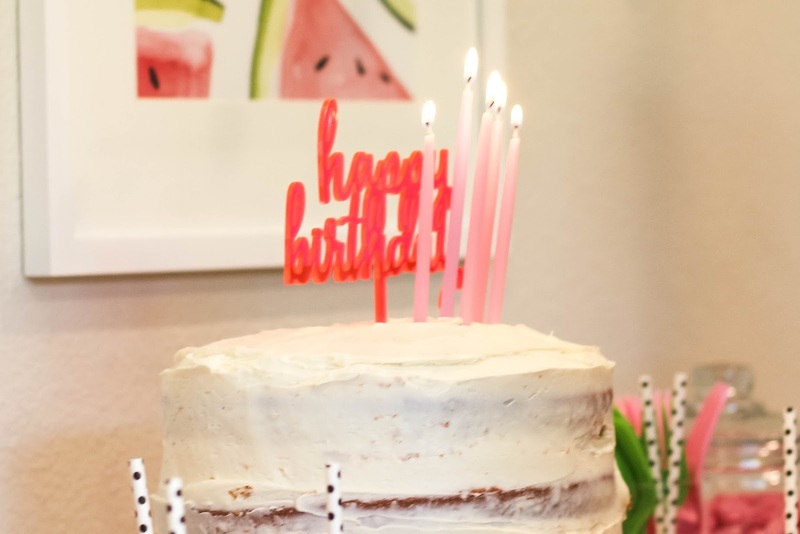 The little happy birthday cake topper is perfect and from Target which their party selection is getting good! I made a watermelon salad which everyone said they loved but I didn't :) ha! 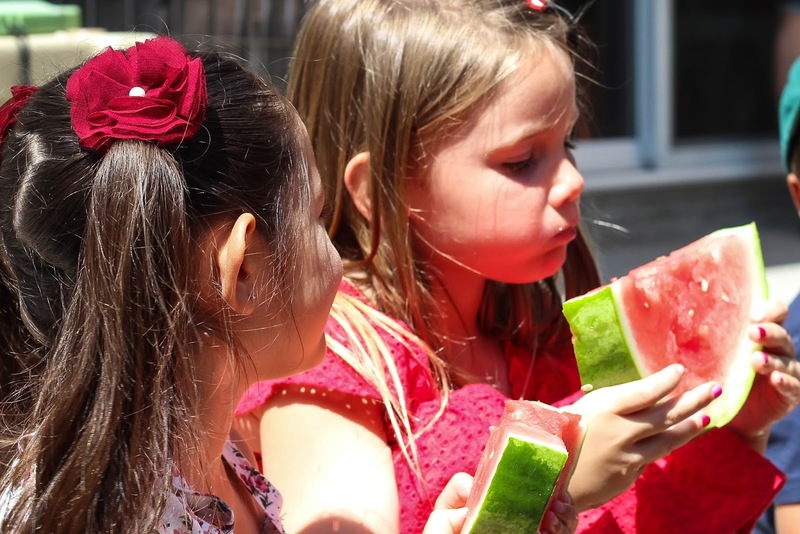 I'm not sure if it's because I don't like watermelon that much or if it was just gross and everyone was being so sweet. 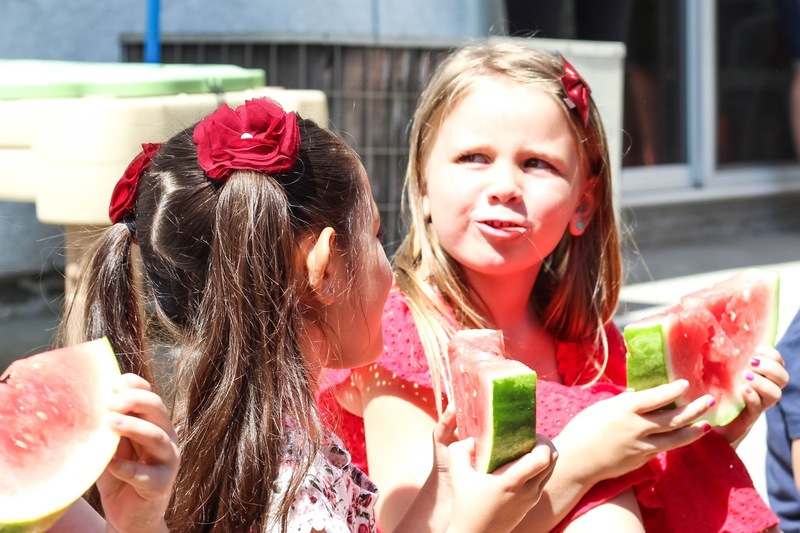 The watermelon eating contest was so funny! 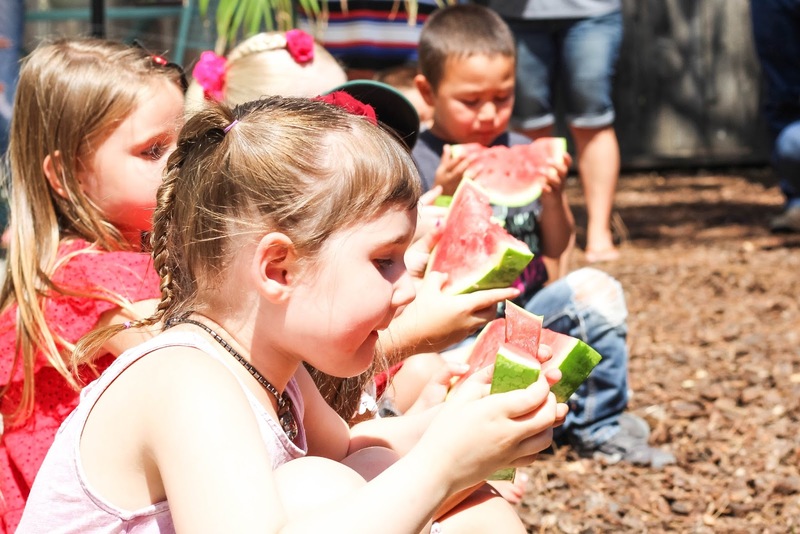 Some took a few bites and just held their piece of watermelon, some didn't even eat a bite and one little lady ate the whole slice like it was nobodies business! I died! She won a giant squirt gun Adie picked out, which shot darts and water! So fun! Watching Adie while everyone sang Happy Birthday was my favorite part. She literally was so darling, smiled and giggled through the whole thing and it made my Mama heart want to burst! We ate ice cream and cake, opened presents which she got her first pair of high heels and she grew up a little more! She loved her skates which how do you teach a five year old how to skate without having a mini anxiety attack each time! :) Celebrating her this last weekend has been another favorite this summer. 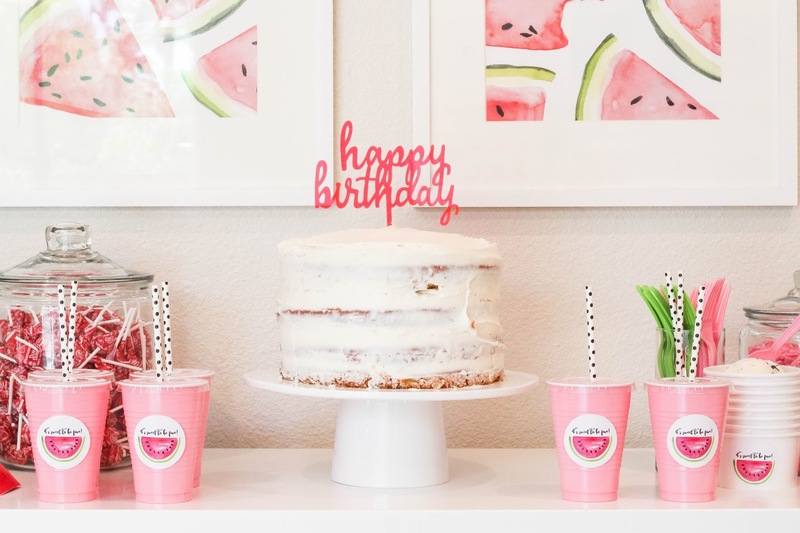 Birthdays are so fun and its what this Mama does because there will never be enough words to tell each on of my babies how lucky I am to be their Mama! Adie turns five on Friday the 30th and she keeps reminding me to come in her room singing her Happy Birthday like we did last year. Which all she wants to do is make cookies :) simple girl. Just love her completely to the moon and back times forever!